Epitaph, Singapore Memorial, Column 136, Age 20. Gordon was a reinforcement for 2/4th, joining ‘E’ Company. He was killed in action on 11 February 1942 during a Japanese ambush. Only about 88 men of the original 200 survived. Please read further about ‘E’ Company. Gordon’s name is recorded at the Yarloop War Memorial along with that of Reg Tooze. Gordon was about 4 years of age when he sailed from London on ‘Orama’ on 27 June 1925 to Fremantle with his parents and younger brother and sister Elizabeth. 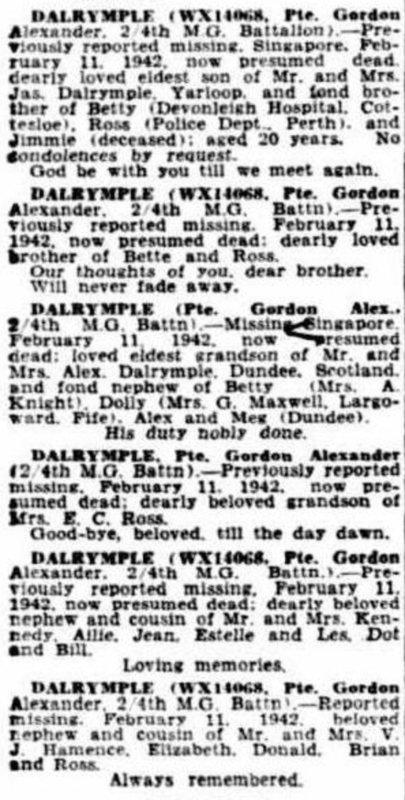 The family soon moved to Yarloop to live where James Dalrymple was employed as an iron turner. The Dalrymples were fortunate to have extended family living in the south west, members of Mary Dalrymples family. Also Yalgoo appears to have been a tight-knit community which proved supportive in challenging times. 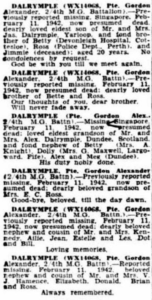 The Dalrymple family endured the tragedy of their second son Jimmie who died aged 6 1/2 years in 1929. The family remained at Yalgoo until at least 1948. Gordon had also worked at Yalgoo and enlisted from here in June 1941. His death would have been huge loss for his family, losing a third son. 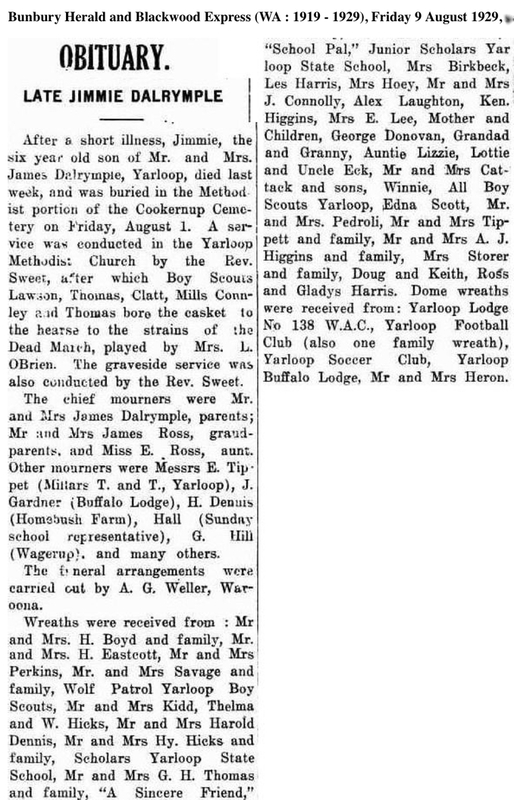 James died in 1962 and was buried Karrakatta aged 62 years.